When is a K-9 Search During a Traffic Stop Unconstitutional? What Are the Rules for a K-9 Search of a Vehicle? Dogs can be trained to detect narcotics at very small amounts. Most law enforcement agencies have K-9 units set up for this very purpose. Typically what will happen is a law enforcement officer will pull over a car who he believes committed some pretextual traffic violation and then that officer will have a K-9 unit on standby, nearby. He will tell the K-9 officer to come to the stop and conduct a K-9 search, even though for legal purposes dog sniffs are not actually considered a search. The dog will give an “indication” that narcotics are in the vehicle and then that gives the officers the probable cause needed to conduct a search. A K-9 search of a vehicle can take place as long as it does not prolong the original reason for the stop. In State v. Baker, 229 P.3d 650 (Utah 2010) the Utah Supreme Court addressed the basic laws that surround a K-9 search. 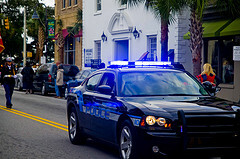 In United States v. Place, the U.S. Supreme Court found that a K-9 search or dog sniff of a vehicle is not a “search” for purposes of the Fourth Amendment. 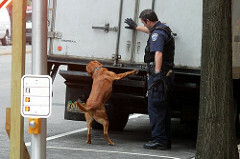 In the subsequent case Illinois v. Cabales, however, the high court found that based on the premise that a dog sniff is not a search, a drug-trained dog may walk the perimeter of a lawfully detained vehicle even if police have no reasonable suspicion that the vehicle occupants are engaged in drug-related activity so long as the dog sniff search does not extend the duration of the stop. So, if an officer prolongs the stop beyond its purpose in order to allow the K-9 search, the seizure that follows may be the subject of suppression. In the Baker case the defendant in that case had been stopped because of a broken tail light. It was discovered he was also driving on a suspended license. The officer immediately placed the defendant under arrest for driving on a suspended license. He then called in a K-9 unit who did a perimeter search of the car and indicated for narcotics, which were then found in the vehicle. The Utah Supreme Court found that the purpose of the stop was completed upon the arrest and the subsequent K-9 search was therefore illegal. Every criminal defense has the right to a speedy trial. “The Sixth Amendment of the United States Constitution guarantees that ‘in all criminal prosecutions, the accused shall enjoy the right to a speedy and public trial.’” State v. Young, 321 P.3d 1127, 1133 (Utah 2013) quoting U.S. CONST. amend. IV. The right to a speedy trial arises after an arrest. See Doggett v. United States, 505 US 647, 653 (1992). When a defendant’s speedy trial rights have been violated, it “leads to the unsatisfactorily severe remedy of dismissal of the indictment.” Barker v Wingo, 407 U.S. 514, 522 (1972). The United States Supreme Court has laid out a four factor “balancing test, in which the conduct of both the prosecution and the defendant are weighed.” Id. at 530. These factors come from the Barker case and they are, “length of the delay, the reason for the delay, the defendant’s assertion of his right, and prejudice to the defendant.” Id. These factors are related and must be considered together in a balancing process to determine if a defendant’s speedy trial rights were violated. See Young, 321 P.3d at 1133. “The Supreme Court suggested in Doggett v. United States that a delay approaching one year is presumptively prejudicial.” Id. at 1133-1134. There are different reasons for delay of prosecution, some of which are neutral and others which are improper. See Young, 321 P.3d at 1134. Whenever the reasons are due to the government’s failure to prosecute, “the ultimate responsibility for such circumstances must rest with the government rather than with defendant.” In Doggett, an indictment was issued against the Defendant but the government failed to prosecute him for 8-12 years. The government contended that they could not find him and that was the reason for the delay. The US Supreme Court disagreed and stated that the defendant was living openly in Virginia and was not doing anything to avoid detection. If the government had actually pursued finding him, they would have. The court found the government’s pursuit of the Defendant negligible and weighed the reason for delay against the government. As to the third Barker factor, Doggett also gives guidance. In that case, the government provided no evidence that Defendant avoided prosecution until he was arrested so the court held that “Doggett is not to be taxed for invoking his speedy trial right only after his arrest.” Id. at 654. The US Supreme Court found that “delay between formal accusation and trial threatens to produce more than one sort of harm, including oppressive pretrial incarceration, anxiety and concern of the accused, and the possibility that the accused’s defense will be impaired by dimming memories and loss of exculpatory evidence.” Doggett, 505 US at 654. Of those prejudices, “the most serious is the last, because the inability of a defendant adequately to prepare his case skews the fairness of the entire system.” Barker, 407 US at 532. Although negligence is obviously to be weighed more lightly than a deliberate intent to harm the accused’s defense, it still falls on the wrong side of the divide between acceptable and unacceptable reasons for delaying a criminal prosecution once it has begun. And such is the nature of the prejudice presumed that the weight we assign to official negligence compounds over time as the presumption of evidentiary prejudice grows. Thus, our toleration of such negligence varies inversely with its protractedness, and its consequent threat to the fairness of the accused’s trial. Condoning prolonged and unjustifiable delays in prosecution would both penalize many defendants for the state’s fault and simply encourage the government to gamble with the interests of criminal suspects assigned a low prosecutorial priority. Id. at 657 (Internal citation removed). In Doggett, the Court found the government’s negligence of failing to diligently prosecute defendant prejudiced his defense, even though he could not allege specific prejudicial facts. In sum, if an accused’s case has been pending for more than a year without the government working toward arresting the defendant or otherwise hailing him to court, he may be able to get the case dismissed for a speedy trial violation. What Are Some Sentencing Conditions of A Domestic Violence Conviction? A domestic violence conviction can carry some very unique penalties including a sentencing protective order. Domestic violence is not a separate crime. Instead it is a category or moniker that attaches to other types of charges when the crime is committed against a cohabitant. Basically, any crime involving violence or physical harm or threats of violence or physical harm will fall under the “domestic violence” category. This means that even the most simple of crimes such as a disorderly conduct infraction can be considered domestic violence. Domestic violence is treated differently by the Utah Legislature – it’s treated much more harshly in the penalty face of a case. For example, when someone is convicted of a domestic violence offense they are automatically placed in an enhancement category which makes it so any subsequent DV charge within a five year period is increased one degree. The court, as part of sentencing can issue a sentencing protective order prohibiting the defendant from having any contact with the victim for the duration of the defendant’s probation, which can be anywhere from six months to thirty-six months. The court can also order the defendant to be on an electronic monitoring system such as a GPS. Additionally, the court can order the defendant to reimburse the victim for any counseling fees incurred and reimburse DCFS for costs incurred. Finally, the court can order the defendant to undergo domestic violence counseling. imposing any other condition necessary to protect the victim and any other designated family or household member or to rehabilitate the perpetrator. One or more of the above orders can be included in a sentencing protective order or simply as probation conditions and they can last for the duration of the defendant’s probation. Marijuana is becoming legal elsewhere but is still very illegal in Utah. As is normally the case in Utah, while the world around us is changing and evolving Utah stays the same, and that is definitely the case when it comes to marijuana use. Colorado and Washington have already fully legalized marijuana and California has a very liberal medical marijuana program. While marijuana remains very much illegal federally the feds have stated that they aren’t going to get involved at this time with the legal use of marijuana in Colorado and Washington. What does all of this mean for Utah? Nothing really. Marijuana is still very illegal in Utah, whether you’re transporting it, using it, possessing it, or even using it for medical purposes. Additionally, while a bill was proposed for a medical marijuana program it was not passed and there is still no legal use of marijuana in Utah whether its used for recreational or medical purposes. In most marijuana cases in Utah the offender is being charged with possession or use of less than one ounce of marijuana. That charge is a class B misdemeanor and carries a maximum penalty of up to 6 months in jail and a fine of $1,000 plus fines and surcharges. If the offender has no prior drug or criminal charges then often a defense attorney can get prosecutors to agree to a plea in abeyance agreement that keeps a conviction of the offenders record, however there are still a lot of hoops the individual has to jump through. 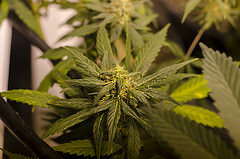 While this simple possession of marijuana is often considered a somewhat light charge marijuana charges can be enhanced and can become very serious very quickly. If it is determined that the marijuana that was possessed was possessed with the intention of distributing it then the charge quickly becomes a felony. Additionally, the only thing a prosecutor needs to charge distribution are items that suggest distribution such as little baggies, a scale, or sometimes simply the amount of weed possessed is considered an indicator that it was for distribution and not personal use. Another factor that could make a marijuana case more serious is what’s called drug free zones. In an attempt to protect children the Utah legislature has drafted a law that makes drug crimes more serious for the offender when they take place in certain drug free zones. A drug free zone is defined by areas surrounding certain buildings and sites, for example the drug free zone includes 1000 feet from any church, park, school, or daycare. The definition is more detailed then this but clearly just from those few things listed her, the drug free zone covers most of the state. If an individual is caught with marijuana in a drug free zone their charge could be enhanced from a class B misdemeanor to a class A misdemeanor. At Salt Lake City Criminal Defense we understand the realities of our current society and we understand how to protect our client’s rights. If you have been charged with a marijuana crime then call us today because we will fight tirelessly for you to make sure your rights are protected and make sure you are informed as to your options. Call or email us today for a free consultation. One way to defend against domestic violence charges is with the spousal immunity. Domestic violence is a huge issue in our society and it has become a hot button topic as of late, however, ever charge of domestic violence is not a case with footage of an NFL football player hitting a woman in an elevator. In fact in many domestic violence cases neither party ever planned for the cops to get involved and they don’t want charges filed either way. How these scenarios usually unfold is a couple gets in an argument, and the argument may escalate to the level where neighbors hear the fight and so they call the cops. When the cops show up they investigate everyone involved and one of the parties may say something like “he pushed me” or “she grabbed my arm” or “he said he was going to hurt me while holding a knife.” With these words the officer will possibly arrest one of the individuals for Assault (DV) (DV = domestic violence moniker, which enhances the charge), Criminal Mischief (DV), DV in the Presence of a Child, or Disorderly Conduct (DV). Once the prosecutor receives the referral from the police officers charges will be filed and the accused individual will be notified. Obviously as attorneys we would counsel that the accused individual should retain legal counsel at this point in the process. One of the hardest things for people to understand in this type of situation is why they are being charged with this crime when their spouse doesn’t want to “press charges.” The reality of this is that the state has the grounds and authority to bring criminal charges against an individual, no one else does, so its not the alleged victim that is bringing the criminal charges its the state, so even if the spouse doesn’t want the case to proceed it often still does because the state thinks that the law has been broken. That being said there is still an opportunity for the defendant to get a dismissal in these types of cases. Even though the state doesn’t need the alleged victims approval to continue with the case they do often still need their cooperation to be able to prove that the offense took place. In cases where the alleged victim and the defendant are married the prosecutor cannot force the alleged victim to testify because of what is called the spousal immunity. The spousal immunity is a right that all married persons have that makes it so they cannot be forced to testify against their spouse. If the parties are just dating then this does not apply they must be married. So if the only real evidence the prosecution has is the alleged victims testimony then they often have to dismiss DV cases like this for lack of evidence if the spouse is not willing to testify. If you have been charged with a domestic violence related case, such as assault or criminal mischief then call the attorneys at Salt Lake City Criminal Defense for help. We have helped hundreds of clients in Utah with their DV cases and we can help answer your questions and make sure your rights are protected. State v. Stewart – Good Example of a Vehicle Stop? A police officer can stop a vehicle for any traffic violation, no matter how minor. In State v. Stewart, decided just a week ago, the Utah Court of Appeals addressed a case that gives a good example of what police, sheriffs deputies, and highway patrol troopers do everyday throughout the state. In December of 2008, Shannon Stewart was pulled over because her taillights were not working. The most common reason vehicles get pulled over is for a minor traffic violation like the one committed by Ms. Stewart. Speeding, malfunctioning lights, and other equipment violations give cops the legal authority to make a vehicle stop. The police officer approached Ms. Stewart’s vehicle and noticed she was “jittery”. As he spoke to her she slurred her words and her eyes did not respond to light very well. Ms. Stewart told the police officer that she was upset because Adult Probation and Parole had been to her house (her husband was on probation) and she did not like what they were doing. The police officer called AP&P and confirmed that they had been at Ms. Stewart’s home. He also discovered that AP&P found a box with syringes with meth residue on them. The police officer then returned to Ms. Stewart and asked her to roll up her sleeves so he could check her for needle marks, which he did find. He then placed her in the back of his patrol vehicle. The cop gave her Miranda rights and she said she may want an attorney. The officer then said he would not question her if she wanted an attorney, which she denied and said she would cooperate. In her discussions with the officer she admitted that the syringes were hers and that she had been using. She underwent a blood test which returned negative for any illegal drugs, but positive for some prescription drugs for which she had a prescription. Ultimately she was convicted of possession of drugs and drug paraphernalia. The court of appeals found that Ms. Stewart’s acting “jittery” and having constricted pupils was sufficient to allow the officer to administer tests to determine her sobriety and therefore she could not have shown that a motion to suppress would have been granted. The court also denied that Ms. Stewart would have won a motion to suppress the statements she made to the police because her request for an attorney was ambiguous, and therefore, the officer rightfully asked additional questions to clarify her request. He verified her request and she said she would cooperate so there was no violation of her rights. All an officer needs to make a traffic stop is “reasonable suspicion” that a crime was committed or is about to be committed. In State v. Welker, 2014 UT App 284, an opinion handed down just a few days ago, the Utah Court of Appeals reaffirmed just how easy the reasonable suspicion standard is to meet for law enforcement. “Reasonable suspicion” is the term given for the standard that law enforcement must meet before legally being able to stop a vehicle occupant to investigate criminal activity. In the Welker case the police received a phone call from a woman who was at her apartment and saw a man in a truck who she believed “may have been” trying to enter a carport of a vacant apartment or “possibly” trying to burglarize her apartment or steal her trailer. This suspicious person was also looking in windows with a flashlight. An officer responded to the scene, saw a truck which matched the description the caller gave leaving the area and made a traffic stop. Upon investigating the officer the police officer determined that the driver was operating his vehicle under the influence of alcohol or drugs to the point of being impaired. On appeal the court of appeals determined that the officer acted appropriately and under the law of reasonable uspicion. 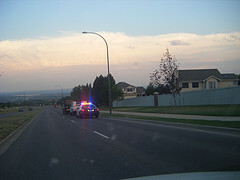 The court reiterated the standard that must be met to make a traffic stop: A traffic stop is permitted “when the officer has reasonable, articulable suspicion that the person has been, is, or is about to be engaged in criminal activity.” Welker argued that the officer did not have reasonable suspicion because he did not describe any specific criminal conduct or any specific facts that he observed that could lead to an inference of criminal activity. The court rejected Welker’s arguments (big surprise) and found that the officer was not required to provide the specifics Welker wanted. Instead, all the officer needed to satisfy was that “as long as the underlying facts, and reasonable inferences drawn from those facts justify the conclusion that reasonable suspicion existed at the inception of” of the stop, the Fourth Amendment is satisfied. Another loss for a criminal defendant in Utah. Who knows, one of these days an appellate court in Utah might actually stand up for individual liberty over state power. Don’t hold your breath.